Whether your Mac is a shiny new friend or an ageing companion, the chances are you rely on it. Trust it. Hey, maybe you even love it a little. We understand, we love them too. So if there’s a problem, we’re here to get you back up and running. Our experienced Apple Certified technicians know every model inside out. We’ll assess and repair or replace anything from LCD displays and keyboards to power supplies, graphic chips, batteries and more. And if it’s software-related? Consider it fixed. If your Mac is simply showing its age, we can often give it a new lease of life. Add extra memory or upgrade to a faster, bigger hard drive – we’ll transfer the data – and you’ll fall in love all over again. We’ll happily tell you what can be done. An Express service is available, we provide insurance quotations and our work is guaranteed for three months. If you get stuck completing the form below, just give us a call. To best help you, we’ll need as much information as possible. Please tell us all about the problem(s) you’re experiencing. When does it happen? How often is it happening? How can we recreate the fault? If you are wanting to upgrade your Mac, let us know what you want to do and we'll get back to you with a quote immediately. PLEASE NOTE - If booking in a Slimline iMac (2012+ No CD/DVD drive) our assessment fee will increase due to the design of this Mac. Click the Apple logo (top left of your screen) and select 'About this Mac'. The serial number should be displayed on the next screen. If you have an older Mac, click the Apple logo (top left of your screen) and select 'About this Mac'. Then click 'more info' and a window will appear. The Mac's serial number can be found under the hardware section. We will need your admin password to work on your Mac. It is the password you use to login with and install apps with. You can drop your Mac to one of our store or if local we can arrange one of our engineers to collect. If you're local (within 5 miles) to one of our stores we may be able to arrange collection of your Mac. 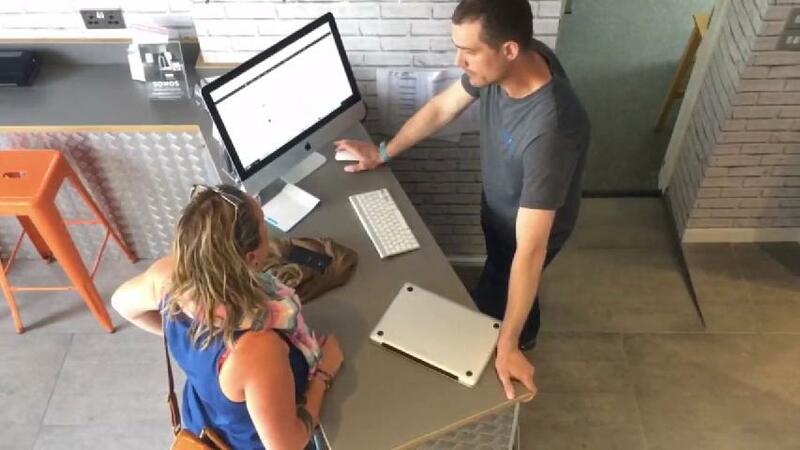 One of our engineers will collect and return your Mac. This is far safer than relying on couriers. Please call us or leave a note on checkout to arrange. Which store will you be dropping your Mac to? More info about Tunbridge Wells. Buy a New or Pre-Owned Mac Instead! We have loads of new and pre-owned Apple computers in our online store and we offer very competitive rates on part exchanges. Browse our online store and if you see something you like and want to part exchange, get in touch.